With reference to the purpose of the Rehabilitation Programme Plan, a person with viscerally disabilities is defined as "A person with disabilities resulting from diseases or respective treatment. The disability, not being limited to locomotor functions in nature, constitutes disadvantages or restrictions in one or more aspects of daily living activities. 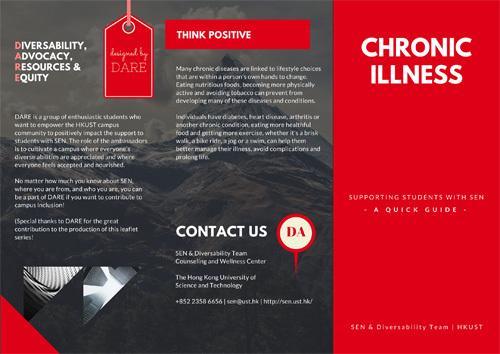 People with visceral disability are much affected by their adverse and chronic health conditions including pain, fatigue and limitations in performing daily functions efficiently. They may suffer from more than one type of diseases such as cancers, liver and lung problems, as well as diabetes. Eligible students with SEN can liaise with professors and tutors for lecture notes and/or powerpoints in appropriate format. There is also equipment in the Library to enlarge documents or convert documents in hardcopy to accessible format.